WASHINGTON — The Obama administration keeps on trying to save their “disastrous” health care law, known by many as ObamaCare but is officially known as the Affordable Care Act. Now, instead of confirming delays in the law’s key mandates, liberal media outlets like Reuters are calling it an extension. 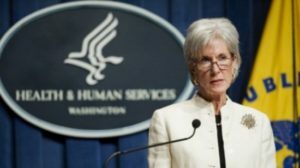 Reuters reported that Health and Human Services Secretary Kathleen Sebelius denied that the most recent mandate delay and Reuters inferred that this was merely an extension of the health care law. The individual mandate is the newest delay of ObamaCare mandates, which meants there will be a penalty for individuals who cannot find health care coverage in the ObamaCare health care exchanges. Sebelius said, in the House Ways and Means Committee hearing this past week, that there will be no more delays and that uninsured Americans will have to pay up. The deadline for enrolling in new individual health care plans is on March 31st. Reuters did note that the penalty can be steep for American families. For not having health care coverage, it will cost $95 per adult or about 1% of family income for this year. In 2016, it could cost $695 per adult or 2.5% of family income. The nonpartisan Congressional Budget Office predicted that the enrollments would reach maybe 6 million people, a far cry from earlier estimates of 7 million.